A warm cup of water with a half lemon squeezed in it is how I start my day every morning. I used to be a coffee drinker, but after being diagnosed with Graves Disease, I didn’t need anything that would affect my thyroid even more, so I had to find an alternative. For me, I liked drinking coffee not because I needed the caffeine or because I needed something to wake me up in the morning, but because I liked the ritual of it. The feeling of looking forward to something, holding the warm cup in my hands, and relaxing with thoughts before my day began. According to Ayurvedic medicine, resistance to disease is either built up or torn down depending on the choices that you make in your daily life. By focusing on daily rituals you work to balance the doshas (three energies believed to circulate in the body) , create self discipline and align your bodies rhythm with nature. So I tried the warm lemon water, and found that it satisfied my cravings. Not only can I have the “ritual feeling” back, but I also feel like it gives me a boost of energy to start my day. And I can see why, because lemons are packed with lots of nutrients, including vitamin C, B-complex vitamins, calcium, iron, magnesium, potassium, and fiber. They have also been known for centuries as an antiviral, antioxidant and immunity booster that fights infections. But why WARM lemon water? Ayurvedic philosophy looks at the relationship between hot and cold in food sources. Cold water slows down the digestion process so it will take longer to get things moving in the morning. Take a closer look at benefits of drinking warm lemon water. 1. Helps Digestion- Lemon encourages a healthy digestion by flushing unwanted toxins out of the body. The American Cancer Society recommends this warm drink to cancer patients to help stimulate bowel movements. A daily glass can also help with indigestion, such as heart burn and bloating. 3. Clears Skin/ Anti-aging- Who needs a fountain of youth when you have a lemon tree? Lemons are beneficial in the fact that they have anti-aging properties. The acid from the lemon juice contain concentrated levels of antioxidants, which help flush out toxins and free radicals from the body (which are responsible for causing wrinkles and aging.) The process of detoxing allows proper cell regeneration, which then manifests by way of glowing and younger looking skin. The high amount of Vitamin C in lemons promotes collagen production, which is responsible for your skin’s elasticity. 4. Aids in Weight Loss- If weight loss is your goal, definitely start your day with this routine, as lemons contain pectin fiber, which assists in fighting hunger cravings. This will be helpful for those who get hungry when you are bored. Instead, have a cup of warm lemon water. It will allow you to feel full and satisfied for longer periods, which eliminates snacking in-between meals. 5. Balances PH Levels- Lemons have amazing alkalizing properties and are beneficial to balancing the bodies pH level. They contain both citric and ascorbic acid that help maintain the pH balance aiding in nutrient absorption, digestion and toxin elimination. 6. 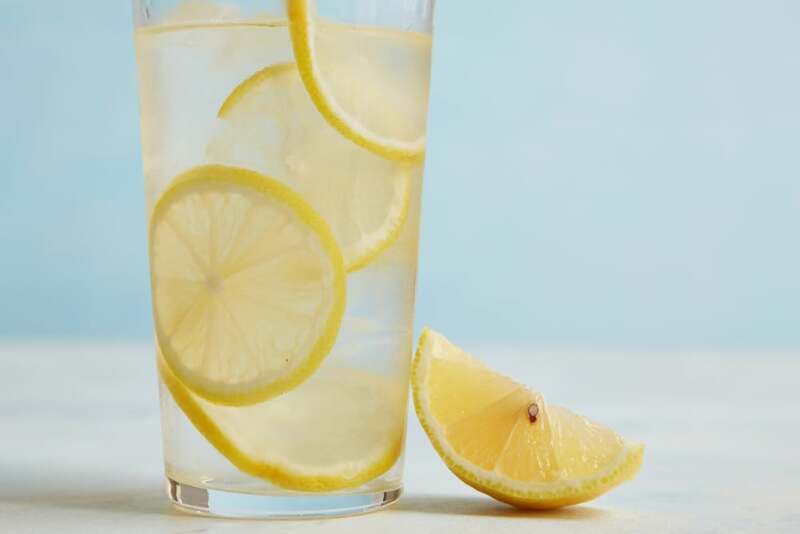 Strengthens Immune System- Warm lemon water has anti-bacterial and anti-viral properties which fight harmful bacteria, fungus, and virus that cause diseases. It also contains saponins, which have antimicrobial properties that help keep infections at bay. Containing lots of vitamin C, lemon helps boost the immune system and assists the body in fighting colds. 7. Detox’s and Cleanses- The liver does the majority of the grunt work in keeping the body clean and getting rid of sludge. Sometimes it needs a little extra help for those that don’t eat healthy. Lemons help flush out the toxins in your body by enhancing enzyme function, therein stimulating your liver. Drinking this daily ensures the increased production of bile, which is a substance necessary for digestion. 8. Adios Caffeine- Try subbing out your coffee for warm lemon water to see how you like it. For me, the energy boost it gives me and not having an afternoon crash is a plus. Did you know that Vitamin C in lemon is a natural stress reliever? Sounds like a good way to start the day. Are you wanting to kick your caffeine habit? Or just want to start your day off on the right foot? If you haven’t done so before. Try it out! I CHALLENGE YOU to 21 days of warm lemon water in the mornings. Why 21 days? Conventional wisdom claims that it takes this amount of time to either make or break a habit. So let’s start making some good habits and letting the good energy flow!